The new MKII version of the Dynavector DV 507 tonearm has made its long-awaited debut, building on the strengths of the original DV 507 which has enjoyed the highest reputation among audiophiles world-wide since its appearance in 1984. As it is a bi-axis inertia controlled tonearm the DV 507, no matter the type of cartridge can trace the music signal grooves cut in the recording with extreme accuracy. The DV 507 also provides superb trackability on warped recordings. Resolution and musical detailing are quite remarkable. The use of precision stainless steel bearings give superb dynamic sensitivity and a stabilised tracking performance without any deterioration through ageing. A larger arm lift gives a stable lift action which maintains its performance over long periods enabling cartridges to be raised and lowered without stress. The new style headshell is suitable for use with a wide variety of cartridges. It is machined from aluminium alloy and has an EIA standard connector. This allows the cartridge to be rigidly mounted and the azimuth adjustment. pure 6N wire is used in lead wires for the headshell and internal wires of the arm. The use of new type damper with a powerful Neodymium magnet gives better damping and ensures that any adverse effects on tracking performance are minimised. The use of a new type of plug-in connector ensures that good contact is maintained with the Rhodium coated headshell contact pin during long-term use. 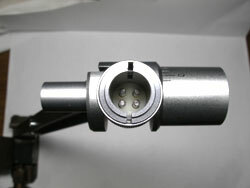 A machined aluminium connector is used. 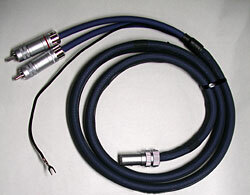 The 5 PIN connector conforms to the DIN standard. Double balanced type shield wire and 4NOFC/6N hybrid construction arm cable. 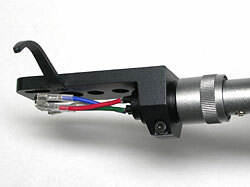 A tone arm is required to operate in two important ways so as to ensure that the cartridge can reproduce faithfully the signal from the record groove. First, there is the need to support the cartridge so that the transfer of the cantilever motion accurately mirrors the audio signal. Secondly, it must maintain an excellent tracking ability for warped records since few records are perfectly flat. These requirements can conflict with each other. 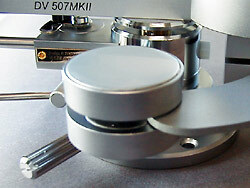 However, the bi-axis tonearm provides an effective solution to the problem. To make the DV 507 MKII compatible with a wide variety of turntables, the overall length and height of the arm have both been reduced compared to the earlier versions. The DV505 and DV501 have enjoyed an excellent reputation in the European audio market since being awarded the Design and Engineering Award at C.E.S. Chicago in 1977,1982 and 1985. The DV507MKII has important sonic improvements as well as being easier to install and use. 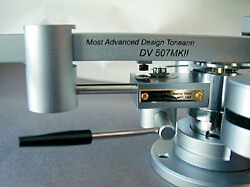 It includes all of the technology of our tonearm design developed since the DV505 and 501. "Bi-axis inertia separation" may sound complex but it simply refers to a tone arm having two arms which operate independently in the horizontal and vertical planes. In contrast, a conventional tonearm has only one arm which moves both horizontally and vertically. This is called a gimbal type tonearm and the inertia for both planes is the same. 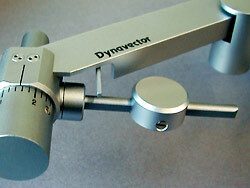 The DV507 bi-axis tone arm has a large inertia for horizontal movement and a very small inertia for vertical movement. We shall now explain the reasons why this is advantageous. It is well known that a cartridge generates an audio signal by the differential motion between the cantilever and the cartridge body. Consequently, if the supporting point of the cartridge (the tonearm) vibrates, the tonearm motion affects the audio signal. In these conditions, the signal, which causes the tonearm to vibrate is of low frequency and large amplitude. In the currently used 45-45 stereo record cutting procedure, low frequency signals are almost entirely recorded in a horizontal direction. This means that the low frequency signal, which can cause vibration in the tone arm, exists only as a horizontal force. The tonearm therefore must have sufficient effective mass and rigidity in the horizontal plane in order to provide a stable platform for the cartridge. On the other hand, for the mid to high frequencies, the effective mass of the tonearm should not be too large since the combined mass of the cartridge and the head shell need to be taken into account as well. In particular, where records have a warped surface, the vertical effective mass needs to be small enough to ensure a good tracking ability on such surfaces. To summarise, the tone arm should have a large effective mass and enough damping in the horizontal plane and at the same time a small effective mass in the vertical plane. These conditions are almost impossible to achieve with a tone arm of conventional design using a simple gimbal pivoting system. 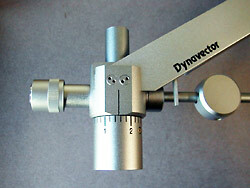 To solve the problem, Dynavector designed a bi-axis, inertia controlled tonearm where the shorter and lightweight vertical sub arm is placed at the end of the horizontal main arm. This is the special feature of our design. 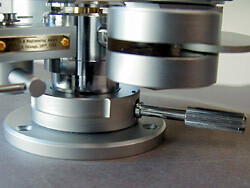 Cartridge behaviour with two different types of tone arm was analysed when tracing warped discs. Fig. 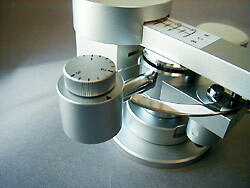 1 is with a conventional tone arm and Fig. 2 with the DV507. In these figures line A refers to the displacement of the record surface and line B the behaviour of the cartridge body. With a conventional tonearm, the displacement of the cartridge is much larger than the actual warp on the disc. At times the cantilever does not touch the record surface. However, the DV507 shows a much better tracking ability because of its low vertical inertia. A non-contact, electro-magnetic damping mechanism has been been designed to prevent sound distortion and poor tracking performance arising from arm resonances induced by low frequencies. In this system, a curved rod attached to the rear of the arm is mounted in a magnetic field supplied by two powerful neodymium magnets. Any minute movement of the rod, due to an undamped arm resonance, causes an eddy current to be induced in the rod, which in turn interacts with the magnetic field to return the system to its rest state. As already demonstrated in our DV505 and DV501 arms, this damping system is highly reliable as there is no performance loss with extended use. Expensive Neodymium magnets are employed because of their superior properties and the thicker copper damping plate used gives a much better damping action. The tracking force is applied by a precision spiral spring device. This dynamic balance system maintains an unvarying tracking force regardless of any record warp. Tracking force is easily adjusted by turning a calibrated dial. 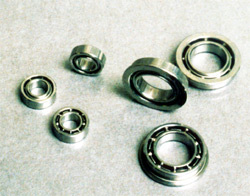 High precision, stainless steel bearings are used in the sub arm. By having a long span bearing support, the dynamic sensitivity has been further improved. The vertical shaft to which the sub arm is attached has a smooth bearing action, an important factor for the arm's operation and sound reproduction quality. Thus tracking ability has been significantly improved and the bearing mechanism performance enhanced. 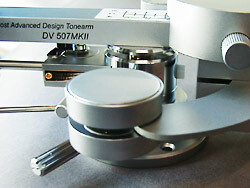 Most tonearms have some frequency response irregularity in the mid-low range at about 100-150Hz. This is called multi-resonance or anti-resonance. To eliminate such unwanted resonances, a dynamic damper has been installed in the bottom of the sub arm. This solution was developed after much theoretical consideration and experimentation. A larger arm lift has been provided to ensure ease of operation so that cartridges can be raised and lowered without stress.The arm lift has also been improved to provide long-term stability of performance. To adjust the VTA (Vertical Tracking Angle of the stylus to the record surface) more easily, a height adjusting lever is provided. The height can be adjusted more precisely than with other systems, within a range of 0 to 7mm. The anti-skating force is set using a dial indicator. The anti-skating force can be adjusted even while playing a record. The overall length of the DV507MKII has been shortened and is now similar to conventional tonearms in spite of its bi-axis design. It is thus easy to install on most turntables. A fixing hole with a diameter of 29 mm is needed to install the DV507MKII on the turntable board. The distance from the centre of the fixing hole on the arm board to the centre of the turntable spindle should be 226 mm. milled aluminium headshell weight 15.4 g.